Borrowed Kindle Books are automatically returned to your library at the end of their lending periods. On Amazon's website, go to your "Manage Your Content and Devices" page. Find the title in the "Your Content" list, then select . Select Return this book in the pop-up window. Select Yes to confirm and return the book. 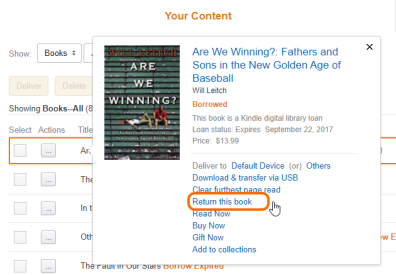 The returned Kindle Book may still appear on your Kindle device or reading app, but you won't be able to open it. To fully remove the title from your device, follow these steps.